We’re getting to the fun part of building a house – planning all the details! Farmhouse decor is the icing on the house building cake. Here’s some of my farmhouse inspiration! I’m writing this post for a few reasons. One – I love sharing this crazy DIY house building project with you. You all keep us encouraged and with a project this size, we need all the encouragement we can get. Two – I love looking at all kinds of farmhouse inspiration when it comes to beautiful interiors and decor. I assume I’m not alone in this fact, so here’s some eye candy for you today that isn’t food. And third – I need some help. I like pretty things and can collect the images, but turning this project into a beautiful custom home is going to be all about the details. I’d love your help/ideas/opinions! We are currently working on the wrap-around porch outside and finishing drywall inside (it’s all hung, but we’re still working on mud, tape, and sanding). The next step will be paint, flooring, and cabinets. I’ve bought some things but I have a little bit of flexibility over the next few weeks if I want to change some things. That’s why were are here, to get some details figured out! Let’s jump right in and start our farmhouse inspiration with the heart of the home. My dream farmhouse kitchen in all of it’s white cabinet glory! I’m planning on a gray island and white outer kitchen cabinets. The island is going to be about 10’x5′ and have a bookcase on the end facing the living room! I’m so excited about that bookcase (hello, cookbook collection). 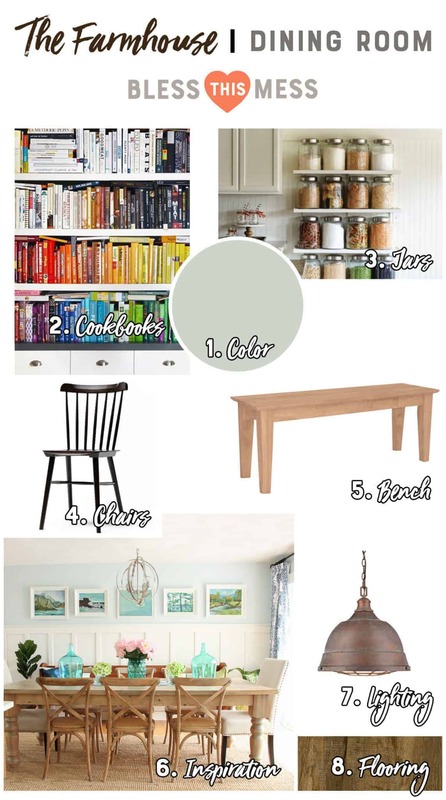 The island color shown is called Rock Port Gray by Benjamin Moore. I love it. It’s a nice warm gray that isn’t too cold or too brown. I’m not having any upper cabinets! If there is counter space along the wall, there are no cabinets hanging above them. I’m super excited for this space to feel really open. Plus I have been collecting pretties for years to put on open shelving. I have white pig platters and a matching cookie jar, a hen cookie jar that is black and white, vintage scales, a vintage rolling pin + cookie cutter collection, and 100 year old wood cutting boards. The cabinet color (as well as all or our trim) is going to be Simple White by Benjamin Moore. I got samples of a handful of different whites and it was amazing how different they were. Simply White is a pretty warm, true to white, white. Am I crazy for wanting white cabinets with 5 kids in tow??? My cabinet guy sure thinks so. Isn’t that sign perfect? I’m going for farmhouse inspiration because that’s what I have loved long before Joanna Gaines made it trendy. 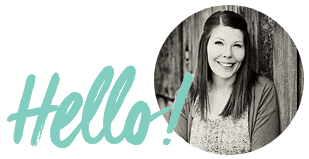 Bring on the farm animals, vintage mason jars, and all things honeybee. I’m going with traditional Shaker-style cabinet fronts that are inset (European style). No clue what I’m doing for hardware though – any ideas? Flooring is going to be Engineered Vinyl Planks from Lumber Liquidators and the color is called Farmland Hickory. I searched long and hard (and got one million samples from one million places), and I’m so excited for these floors. They have just the right amount of texture, and variation, and are going to withstand years of traffic. We just ordered online and they are sitting in the garage waiting for us to install them. I got these seeded glass pendants with little flecks of copper in them from Bellacor and they are stunning. I had to pick out lighting before we wired so they have been in the barn for months. Three of them will hang over the bar. I can’t wait for you to see them in the house; they are so so pretty. I just saw they are 20% off too if you are in the market! I don’t know when I decided that I needed a giant copper hood in my life, but this beauty has been in the works for the better part of this year. I’m getting this custom-made in St. George from Coppertop Metals. They produce gorgeous metal products for homes (hoods, chimney caps, lighting, art). Highly recommend working with them on any project (and he ships a lot too!). Giant vintage reproduction sink? Yes please! I looked for a double drainboard vintage sink for ages but never found one. I did, however, find this double sink with a 9-inch backsplash. Not a traditional apron front farmhouse sink, but I love the vintage look. Things that I have questions on: I don’t have tile for the backsplash picked out. I’m thinking 4 inch hexagon tile in white. It reminds me of honeycomb. Do you think hex tile will look too modern? Any other tile I should know about? Am I crazy for wanting white cabinets? I haven’t picked out countertops yet. I’m planning on quartz. Do I do white, light, marbled, dark? Do tell, what makes sense here if I do with with gray + white cabinets? I’m thinking white. Overkill? I’m loving the color Sea Salt by Sherwin Williams. It’s a light green and it may or may not end up in all the rooms. 🙂 The living room walls are going to be shiplap, and the wall color is still being figured out. There’s a small wall (maybe 6-feet long) in one corner of the room that I don’t know what to do with. 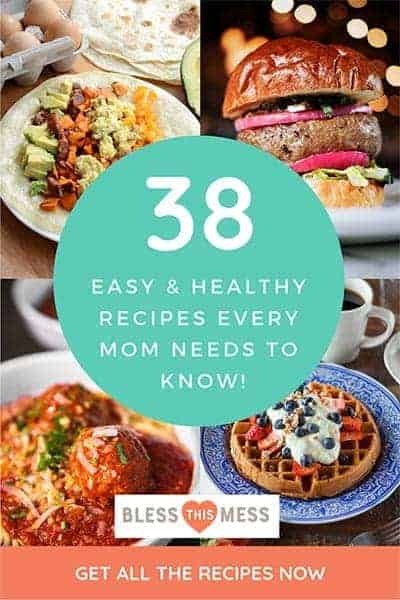 I thought about shelving and doing a rainbow colored cookbook display or maybe displaying some of my bottled jars of food? This is another option for that wall, shelving with pretty bulk storage. It might not make sense to do it there though, because you can’t see this wall from the kitchen. What do you think? What would you do with a little space in your dining room that is just around the corner from your kitchen? My hutch goes on the one other wall, so that’s something to consider. I’m not sure where I saw these, but somewhere called them salt chairs. I think they are pretty. Colored though? Eventually Thomas is going to make me a huge farmhouse table that is 9’x4.5′ (I wanted it wide so that you can have all the food down the middle and still have room for your people!). He’s going to build it with wood from our first love, The Shanty. I think that I want benches on at least one side of it, and chairs on the other. What do you think? We have a lot of options here. Two shorter benches for ease of use? This is the dining room from a blog I love, The Happy Housie. I keep coming back to it when I need inspiration. I love her style. I wanted to bring some of the copper from the kitchen into the dining room, so I chose these gorgeous copper pendant lights. Again they are from Bellacor and are happily waiting in the barn for their install. What you can’t tell is how big they are. They are over 16 inches wide. I have three to hang over my large farmhouse table. I can’t wait to see these in! I think the Sea Salt on the walls might really accent the patina of these copper pendants! Flooring is going to be Engineered Vinyl Planks from Lumber Liquidators and the color is called Farmland Hickory. These beautiful floors are actually going in the majority of downstairs including the stairs, hall, living room, mud room, and laundry room. I wanted to go with one main flooring so that it felt cohesive. Things that I have questions on: I have two huge windows in this room. One that faces the barn, but you can see a lot of my neighbor’s junk/yard, and one that faces my own front yard. We aren’t doing a lot of window coverings on the side of the house that faces the field, but do I want some here? What would you do on a little wall? Storage? Books? Pretties? I wanted a neutral that ran throughout the house. I liked Rock Port Gray so much that a friend suggested I get it mixed at 50% the color and use it. It’s awesome. Everywhere I don’t have a color is going to be this 50% Rock Port. That’s the view from our living room! We are planning around that view for sure. This is a picture of a fireplace that both Thomas and I liked, though we still have a lot of freedom in what we do. We haven’t had a TV in years but the kids really want one. I think we are going to put one above the fireplace behind some doors. Part of me doesn’t want it and part of me says that if I want my kids to play at my house, we need a TV in a public place. Movie nights with friends happening in the living room instead of a basement sound healthier. Maybe we’ll end up with both? Time will tell. It’s a corner fireplace with a wood burning insert that opens and closes with a window to see the fire. Flooring is going to be Engineered Vinyl Planks from Lumber Liquidators and the color is called Farmland Hickory. Isn’t that name perfect? LOVE this one! I think a rustic leather couch would be so pretty! I feel like I need to pick furnishings – help a sister out! What do you think? I have no idea but I like this one. I want a natural fiber and I assume it will be 100% wool. Things that I have questions on: pick out cute stuff for my living room so that it looks good, mmmmkay? Any thoughts on a beautiful corner fireplace? I know that it’s crazy, but I’ve had it in my mind and heart that this house will be in Better Homes and Gardens or Country Living Magazine one day. I feel like the difference between a lot of houses and a print magazine-ready house are the little neat details. What would make this really fun/custom/gorgeous?! There have to be a few perks of building your own house (speed of completion is not on the list), so we are going to make the details (like having a drinking fountain!) one of them. 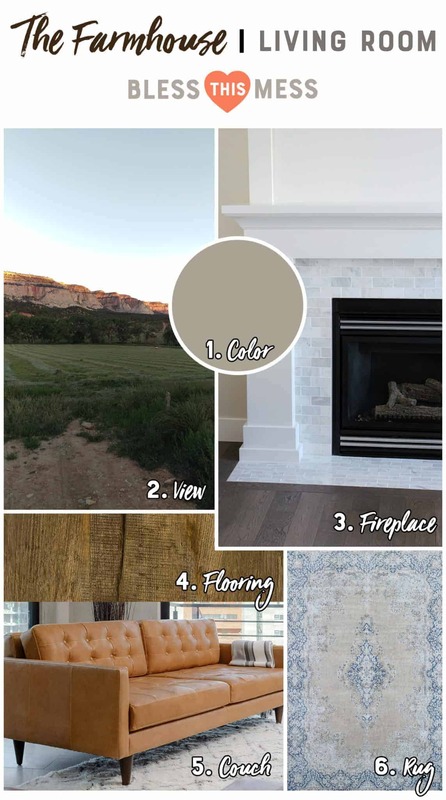 I’d love to hear your thoughts, so share your favorite Pinterest farmhouse inspiration pictures, and tell me what you would do! Long live a great community willing to help a sister out. Your house is going to be AMAZING!!! Oh, I am so excited for you! I think hexagon tiles for the backsplash sound super fun, I totally get the honeycomb vibe! 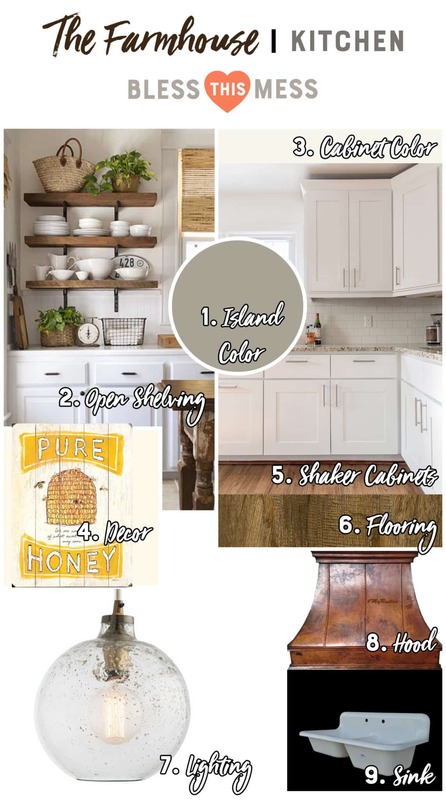 I love your paint choices for the kitchen and I love shaker cabinets! When we remodeled our house in Oregon, we built shaker style cabinets and painted them white – go for white, it makes your kitchen so bright and clean and open! I had little kids and I still loved my white cabinets. I went with simple vertical pulls for the doors and drawers to keep the lines clean. We did dark grey/blue slate countertops that I loved. I’m adding a link to a blog post we did about our finished home so you can see our kitchen. http://deargoodness.blogspot.com/2013/10/interior-before-and-after.html (you’ll have to scroll a bit for the kitchen pics). And your sink and hood? I die! So so great. As for your short wall that you’re not sure what to do on…I think I might do a mix of storage and pretties? I have no idea, sorry! I love the big mason jars full of random grains/beans/pastas. Good luck decorating your home, I found that was pretty much the hardest part! My advice is just to make sure you really love the things you get and you aren’t just getting ‘filler’ stuff. If it makes you happy, display it! So glad you pointed me to that post! You guys are amazing! And I SO agree with your idea of only filling it with stuff you love and not just stuff. If isn’t not going to bring me joy, I’m going to skip it 🙂 You are the best! M.
Drawer and door pulls and knobs….. Be careful of some….they reach out and grab pockets, shirts, shorts. I’ll send you a pic of mine….. the knobs still catch me ocassionally, my shorts pockets are the perfect height…. oh well, maybe I will still grow taller… Wooden ones can be repainted to change your kitchen’s looks whenever the whimsy thought hits! Honey color would be awesome! I volunteer for the painting party! Have Thomas arm me with a good 1.5″ sash brush and away I’ll go!! I like the white and gray…perfect neutral base for any colors you want to add. Your light fixtures are the bomb!!! The range hood…..slobber! How about copper backsplash? I LOVE the color sea salt! I painted all my bathrooms that color in my new house! You will love it! it is very calming! Yay! I’m so glad to have a good review! I have a similar remodel that’s going to happen in the next 6 months! I wish we were skilled enough to do it ourselves—I can tell your kitchen is going to be gorgeous! I have similar cabinets selected and custom metal hood, too (but stainless!). Can’t wait to see yours when it’s finished!! Your big window that faces the barn…… how about a big or a couple of medium stained glass pieces…..the light still comes in but the focus is on the stained glass, not on the barn and beyond. I miss our fireplace insert. If you dont have a big gathering room downstairs then I’d definitely have a tv by the fireplace. I’ve found just having a TV doesn’t make this the fun house. Other families have video games so the kids want to play there. Your food and fun activities will make your house fun. Good idea to cover it so if doesn’t get heat/smoke damage. I plan to remodel my family room, dining room, kitchen in the next 3 months. I plan on using a copper pendant light in my dining room and my living room. For this I have prepared a special design. And I hope the results satisfy me. But really I got inspiration from your blog. Thanks for sharing this. On the other hand if you need a trusted builder for your house solution, I recommend http://www.biesterbos.nl; They do an amazing job and are developers with cost-effective projects. You should check it out.